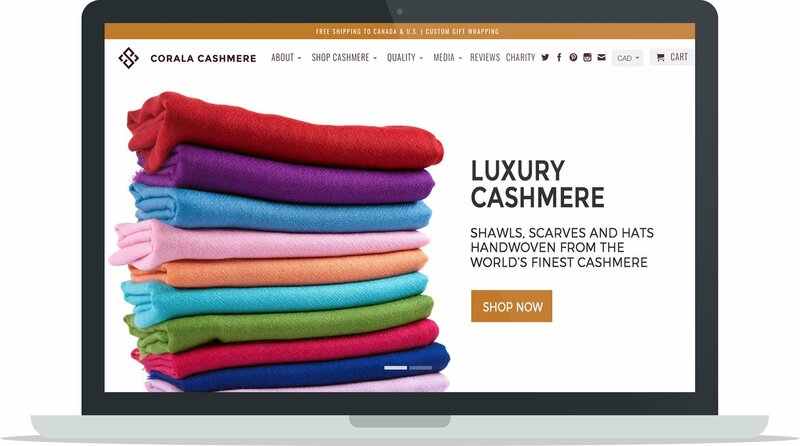 In this ecommerce business case study learn about Corala Cashmere, an ecommerce store that specializes in selling luxury cashmere accessories such as scarves, shawls and hats. Learn about the founders Praj and Dave and how they initially discovered beautiful cashmere products on a trip to Nepal, spent time learning about the history of cashmere and the methods to create cashmere products and developed their interest in the cashmere business into their own ecommerce store. 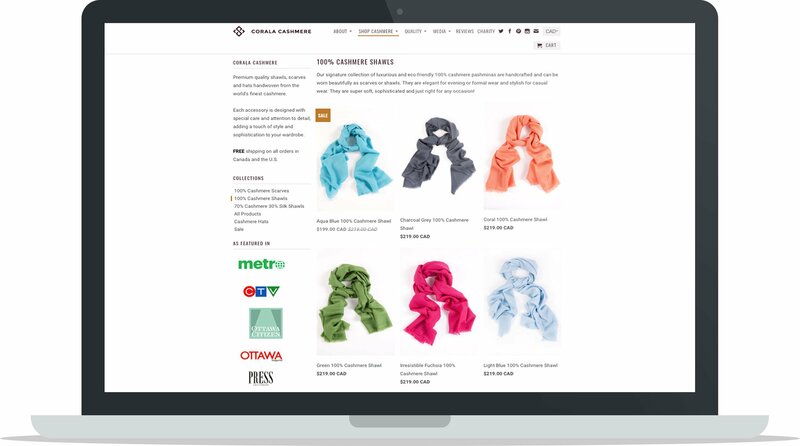 Find out more about their business, how they found the right supplier of cashmere products, how they differentiate themselves in a saturated market, how print media has helped them generate traffic and more. Where did you get the idea to create luxury cashmere products? The idea to create a company of luxury cashmere products happened after a honeymoon trip to the Himalayan mountains of Nepal. While visiting, my wife and I discovered the country’s rich cashmere heritage and industry. When we first touched the product, it was extremely soft and yet very warm to wear. We thought this would work well for the Canadian and US winter seasons. Cashmere is also very long lasting and makes for great gifts during the holidays. How did you know there was demand for your products? Did you test demand prior to launching, if so, how? Cashmere products have been in fashion for a long time and so we knew there was already a market for our luxury accessories. Knowing there was customer demand meant that we didn’t have to spend a lot of time validating our business idea before launching our product line. We did however test the different types of cashmere weaves, blends and colours with family and friends to get a better sense of what products might sell well. 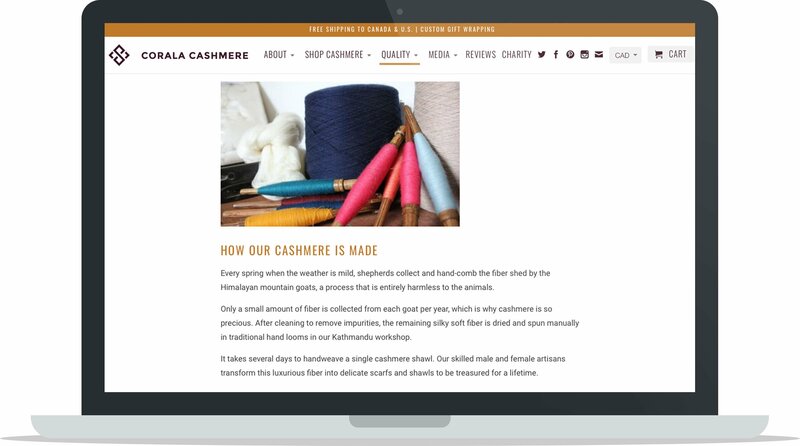 Many stores sell cashmere products, how have you managed to differentiate yourself from your competitors? We have managed to stand apart by focusing on creating products that are of the highest quality, but at a competitive price. Just as gold has different types of purity, so too does cashmere. Our products are made using only Grade A premium cashmere and are handwoven using traditional techniques. This sets us apart from other cashmere products that are often made with lesser quality cashmere or mass produced using machines. What challenges have you faced when sourcing your cashmere and how did you overcome it? How important was it to you that the materials be sourced from Nepal? We faced a number of challenges in sourcing our cashmere products, most importantly finding a supplier that offered the high quality of cashmere that we were looking for. By meeting with dozens of potential suppliers and testing the quality of their cashmere we were able to find the right partner. We knew from the start that we wanted to source our products from Nepal. The unique climate of the Himalayas creates the perfect breeding ground for the cashmere mountain goat and the ideal conditions for the cashmere that’s shed naturally each year. How did you go about finding the right factory to work with to produce your products? We took our time in finding the right partner to help us produce our first collection of shawls and scarves. After spending six months in Nepal learning about the cashmere industry and meeting in person with suppliers, we eventually found the right one. We visited the factory to ensure the working conditions were good and we tested the quality of their products to make sure they met our standards. How do you design your products? Do you work with a product designer or do you design them yourself? We work with our supplier to manufacture the products, but we do most of the design work in house – meaning that we select the colours, weaves, labels and finishing touches ourselves. We love process and creativity of choosing from hundreds of different colour options and seeing how our customers respond. When we started we didn’t have an existing customer base, so we were basically starting from scratch. We were willing to start small, knowing that we would have to build a following as we went along. What we weren’t prepared for was just how quickly momentum would build. We launched right before the Christmas season, which was perfect timing to create initial demand and momentum. Our best tool is actually the ecommerce platform we use. It keeps our customer data and inventory counts up-to-date and allows us to integrate with a number of resources like MailChimp and Facebook to run our marketing. It also handles the back and forth communications with customers and makes payment processing simple. The other key tool is the G-Suite of products and services from Gmail to Calendar and Docs and Sheets – all this had helped our workflow internally. Which ecommerce platform do you sell your products on and why? 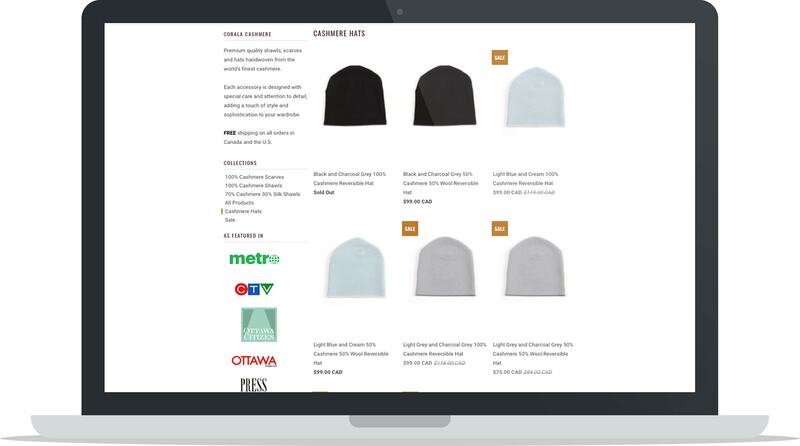 We built our ecommerce site on Shopify because of the platform’s ability to manage everything all in one place. We setup a basic site in less than a day with a few product photos and descriptions. The platform made it easy to manage orders, track customers, process payments, and automate many of the day-to-day business functions, allowing us to focus on growing other parts of our company. How do you take your product photos? Do you hire a professional team or do you take them yourself? We started by taking product photos ourselves, but that didn’t work out very well and so quickly realized the need to hire a professional to make them look better and more attractive for customers. Because we sell online, having high quality product photos is an important investment and was well worth spending the time and energy to get them right. Because we sell online, having high quality product photos is an important investment and was well worth spending the time and energy to get them right. We started by shipping and fulfilling orders ourselves, which gave us full control over the process and taught us a lot about what worked and what didn’t. We knew offering free shipping was going to be an important selling point, especially in selling from Canada to the US market. The unboxing is definitely important, especially when you are buying a luxury product. The packaging creates an experience for the buyer which is why we chose to invest a little extra for nice gift wrapped boxes. For us it’s an extension of the brand and part of delivering something that surprises and delights customers. We made our first 10 sales through family and friends. That early support got us going. After that print media helped generate a lot of attention and drive an initial wave of sales. The first 100 sales were pretty organic. Articles in local newspapers and magazines helped drive people to our website. People found us through search engines because we were writing about our story and products, that also drove traffic. Having a clean easy-to-navigate website with simple product options and free shipping definitely helped too. There are always lessons learned in business. Nothing we have done has been a failure, but we know there are areas where we would do things differently if we started from scratch. Investing more early on in social media support and paid advertising would have been smart. Also bringing someone on board to help with accounting would have been a good idea. In the beginning we tried to do everything ourselves and it’s hard to be a master of everything. We have been pretty successful in setting up an online system to make it easy to run our business from almost anywhere. We’ve also had a lot of success getting featured in print media which has helped us generate a lot of our sales so far. Find a mentor to coach you along. This is so important. It will save you so much time, money and effort. Running a business properly is a full time job that requires you to learn so much early on. If you can find a mentor in the beginning who understands your business and industry it will make life way easier. We have received lots of great input, but one piece of advice that sticks out is to never undervalue yourself or your products. As a new entrepreneur, competing in a crowded market can be scary. But if you know you have a great quality product or service, do not underprice that offering or undervalue what you bring to the table. If you know you have a great quality product or service, do not underprice that offering or undervalue what you bring to the table. One year from now we’d like to have more diversification of our cashmere products. We currently sell cashmere scarves, shawls and hats, but hope to expand into other cashmere accessories like cashmere blankets and baby wear. One thing we attribute our success to is being able to leverage our strengths to give us a comparative advantage over others. One founder is strong in communications, digital strategy and public relations, while the other has an eye for design and strong relationships in Nepal where we source our products. We essentially bet on our strengths and built the business around those talents – that’s what’s had the biggest impact overall.